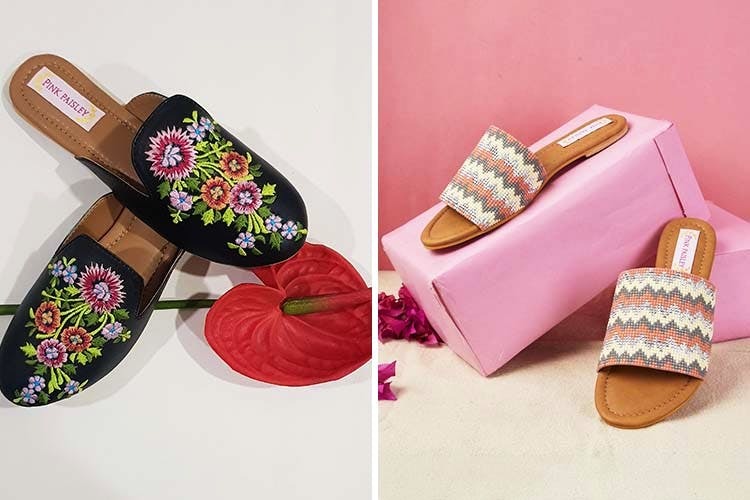 Pink Paisley is an Instagram store for handcrafted jewellery and footwear (think printed juttis, dailywear loafers and embroidered sliders). Everyone who loves flower prints on footwear, can't get enough of charm bracelets and doesn't mind bling will probably already think that Pink Paisley is awesome. Delicate metal charm bracelets in rose gold, copper silver mix and ones studded with Swaroski crystals - there's something for everyone. If bling is not really your style, check out Pink Paisley's white Hamsa Hand with black thread, their black beaded evil eye bracelet, or the plain metal four-leaf clover one. As for their footwear, we like the black loafers with minimal, floral detailing; their studded juttis could be a great addition to your dressy wedding season looks. Ikat lovers, this brand also does ikat fabric juttis in a bunch of colour combos like monochrome, pink and orange, and in tones of blue. Since sliders are all the rage these days, Pink Paisley also stocks a few pairs with aztec prints. They deliver PAN India and take a minimum of seven days to get the products delivered. If you're not a fan blingy bracelets and heavily embroidered footwear, Pink Paisley might have very limited options for you. We also feel that the accessories are a little pricey. They can even customise bracelets and footwear for you. So, if you have a design in mind, don't hesitate to let the Pink Paisley folks know.